The Environmental Protection Act 1990 (EPA) and other relevant UK laws (see our Law Search page) regulate how waste should be managed. These laws establish a number of waste offences, punishable by a fine or prison term. If convicted in the Magistrates court, the maximum punishment for these offences is 12 months imprisonment and /or an unlimited fine. In the Crown Court, it could run to a 5 year jail term or an unlimited fine. Please note that the above offences relate more to businesses (particularly those involved in waste management) than to domestic households. 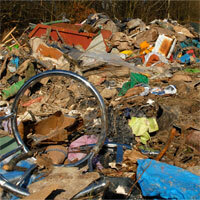 Householders do not require a licence for their waste. However, it is an offence for householders to dispose of waste in a way that is harmful to the environment or human health. The legislation is primarily targeted at fly-tipping and other illegal waste transfer that cost local authorities millions of pounds to clear up. Local councils now have more powers to penalise illegal fly tipping. Fixed penalty notices can be issued or a person can be prosecuted for an offence, and face imprisonment and/or a fine. Under the Clean Neighbourhoods and Environment Act 2005, local authorities have the powers to issue fixed penalties on households who fail to put out their rubbish at the proper time for collection. Some local authorities treat waste put out at the wrong time as fly-tipping. To avoid fixed penalty fines of up to £100, please check your waste collection dates. (Contact your local authority for more information.) See also the section on litter. Please Note: This section provides an overview of waste offences and cannot be relied on as legal advice. If you are in doubt as to whether you are acting within the law, please seek legal advice. If you suspect someone has committed a waste offence such as fly tipping, call the Environment Agency (England), Natural Resources Wales or SEPA (Scotland).